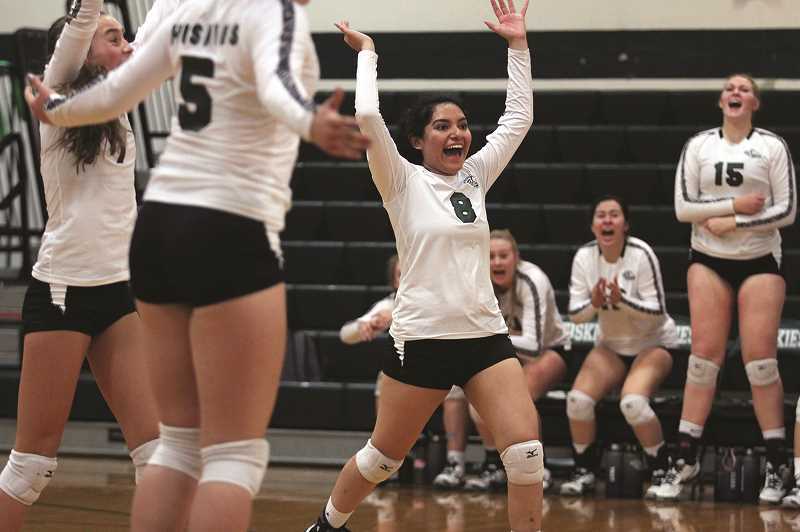 It took more than a month to finally get here, but the North Marion volleyball program officially was able to trot out its full lineup last week when they hosted the Estacada Rangers on Sept. 25. The Huskies had been without junior Kelsey Richardson for the first 10 games of the season due to complications with her transfer from the 2A Gaston Greyhounds over the summer, but once she was able to get on the court, her impact was immediate. "Getting Kelsey back today was huge," North Marion head coach Jackie Arnold said. "We had to get the approval from the OSAA and we got it two hours before the game." The Huskies were already on a roll entering last week's home game against the Rangers, coming off an unbeaten weekend at a tournament in Elmira to bring their win streak to four games. But seeing Richardson enter the game early into the first set gave North Marion a much-needed spark of energy. "Having her come on the court, it made us all so happy," North Marion senior Raymee Boese said. "I felt that we brought it even more — more heart, more energy, more toughness — we knew that we had to step up if she was going to be playing." Both teams entered the contest unbeaten in league play, and the Huskies expected the Rangers to be one of their fiercest opponents this season. Instead, North Marion was able to dominate the game to the tune of a 3-0 (25-18, 25-22, 25-18) win to take control of the Tri-Valley Conference early in the league schedule. "We were expecting them to be the hardest team in our league, so we were mentally preparing ourselves to have a competition," North Marion senior Emma Morcom said. It was a continued sign of just how much the Huskies have grown as a team since the opening of the season. After going 3-3 over their first six games, North Marion has won six straight contests, including a 3-0 (25-8, 25-10, 25-16) victory over Gladstone on Thursday to start the season 4-0 in league play. "We've been on the road a lot and we learned to play tough on the road with a lot of intensity," Arnold said. "We didn't start out that way. I wish we could go back and play Banks and Astoria." And the wins haven't been particularly close, either. Throughout North Marion's win streak, the Huskies have dropped just one set against Madras in Sept. 20. Since then, they have won 13 straight sets. "We have been practicing a lot on serving and defense, which is a big key to winning games, and I think it really helped in this game," Morcom said. Most of those victories came without Richardson, whose presence in the lineup only strengthens the Huskies further as the team looks to continue their strong stretch of play into the second half of the season, which includes the team's varsity home tournament on Saturday. "She's a very strong server, can hit spots, and is a great passer," Arnold said. "You can rely on her to keep the ball in play or put it away. She sees the floor. She has a high volleyball IQ. She may not be the strongest hitter, but she definitely is one of them." "She brings a lot of energy and good defense to the team," Morcom added. "She's just a really good, well-rounded player, and I think we needed a lot more energy and she definitely brings a lot more into it." Though it's not as if the Huskies have been entirely without Richardson's presence until her debut against Estacada. Though she has seen little floor time this season, Richardson has been with the team throughout the off season, during practices and has been the team's biggest cheerleader while waiting for her turn to play. "Before she started officially playing on the court, she was like a coach to us," Boese said. "She told us we needed to get there and it was almost better hearing it from her." North Marion (9-3, 4-0 Tri-Valley Conference) was scheduled to finish the first half of their league schedule on Tuesday against Corbett (9-3, 3-1 TRC) before hosting the Molalla Indians (2-10, 0-4) on Thursday. 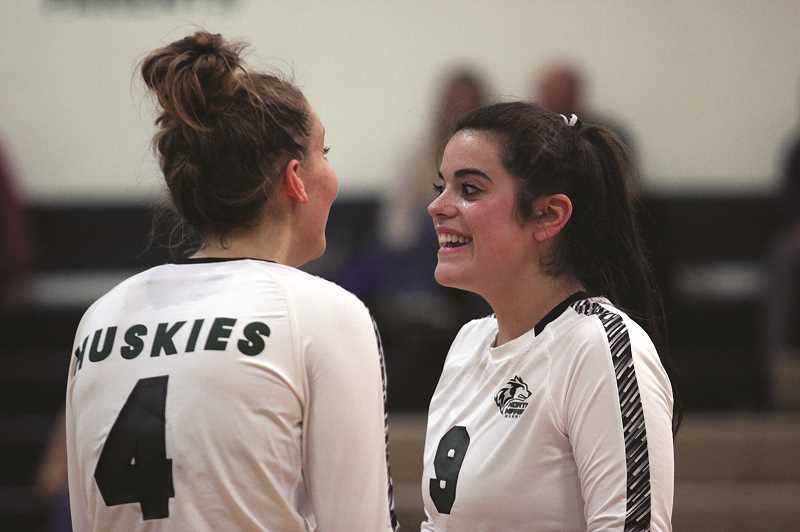 The Huskies then move on to their home tournament on Saturday, part of a home-heavy slate of games to finish the regular season and give North Marion a push toward its goal of a league title and a berth in the state playoffs. "I think we finally realized that we put each other before ourselves," Boese said. "We trust each other and we're able to dominate and play with heart throughout our games."